Located near the Vietnam-Laos border, the cave was found by a local man named Ho-Khanh in 1991. The locals, it is said, were too afraid of the cave to go exploring because of the sound coming from the fast-moving underground river, as well as the huge vertical drop. 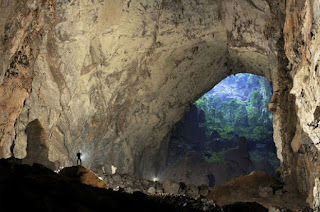 The world's largest cave was only discovered in 1991 in Vietnam, and now tours are being offered to the public. 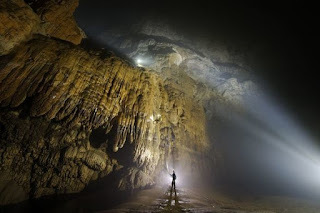 Named Hang Son Doong and known to some as the Mountain River Cave, is so large that it could hold a modern-day skyscraper inside of its caverns, and has its own small jungle. In 2009, a group of scientists from the British Cave Research Association began an extensive survey of the cave's depths. 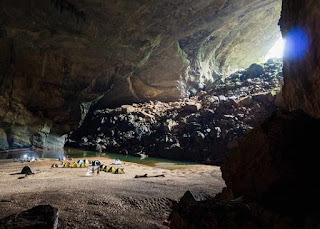 According to Howard Limbert, the man leading the survey, the cave is five times larger than Phong Nha, which once held the title of the largest in Vietnam. The biggest chamber his team found is over 5 kilometers long and 200 meters tall. The jungle found inside of the cave has formed underneath a collapsed roof in one of the caverns. After the roof collapsed, enough light spilled into the cavern that vegetation was able to creep in slowly from outside. As the vegetation took hold, larger and larger plants began to grow, and now hornbills, flying foxes, and monkeys dwell in its branches. In 2013, public visits started to be offered by Oxalis, providing the chance to spend days inside exploring, as well as camping, in this massive cave.